You know, as much as I would like to only read one book at a time, there are too many things calling my name this week. I think I currently have four listed on Goodreads, which doesn’t include what I’m reading for my dissertation and what I’m reading for work. I realize I’m in a place of transition with my reading life, since I’m not a classroom teacher anymore, but apparently old habits die hard. 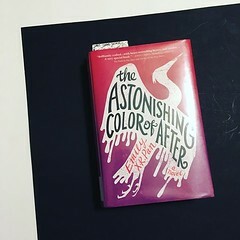 So this week’s Book Beginnings and The Friday 56 come from The Astonishing Color of After, one of the few books that I’m reading that I have a physical copy of. The Astonishing Color of After is about a Taiwanese-American girl who is grieving the loss of her mother while getting to know her Taiwanese roots. There’s some magical realism that’s playing out so beautifully so far. My mother is a bird. This isn’t like some William Faulkner stream-of-consciousness crap. My mother. Is literally. a bird. Right off the bat, I was drawn into this story. First, she makes reference to Faulkner, which endears me to the protagonist. I’ve only read a few Faulkner pieces, but his style is definitely interesting. And then the use of full stops as emphasis. I’m sold. Now I wasn’t sure how the magic was going to play into this story, and I have actually had some trouble suspending disbelief. I’ll have to see what happens as I continue. “My mother has turned into a bird,” I say in English. Waipo nods. Herein lies the real magic. Leigh, the protagonist, has just met her maternal grandparents, is finding ways to communicate with them (through art) even though they don’t speak the same language. There were some shady bits around here – I’m not sure how I feel about those yet either. I suppose we’ll see. Have you read this? Does it sound interesting to you? What are you reading this weekend? “Believing is a type of magic. It can make something true.” From The Astonishing Color of After by Emily X. R. Pan. I’m left wondering how their mother turned into a bird?! I’m intrigued to say the least. Happy weekend!